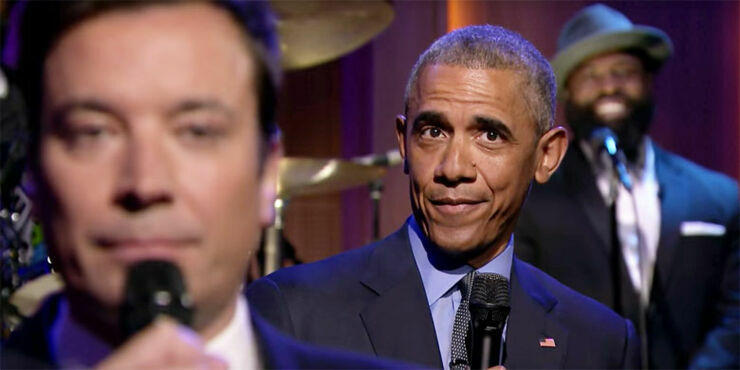 President Obama went all out for his latest, and probably last as president, appearance on The Tonight Show as he joined host Jimmy Kimmel for a showstopper, when they revived Kimmel's "Slow Jam the News" segment. And for a 'possible' last appearance he didn't disappoint. It was a classic. It's pretty much the funniest he's ever been—outside of those White House correspondents dinners—as the POTUS jams with Kimmel and The Roots' Tariq Trotter. The trio covered all manner of topic in a sensual and cool-as-f*ck way: the economy, Step Curry, Obama Care, Hilary Clinton, climate change, even Rihanna. There's no way Clinton or Trump could ever live up to a performance like this, it would just be too cringeworthy. But not when it comes from Obama, it's pure classy entertainment. Once the next eight months are up and he's gone, people are going to miss moments like this—no other world leader could get away with it without being mercilessly mocked.